One of the true joys of being good at sight-reading is discovering new music. We want to help students improve their reading abilities while exposing them to good music. 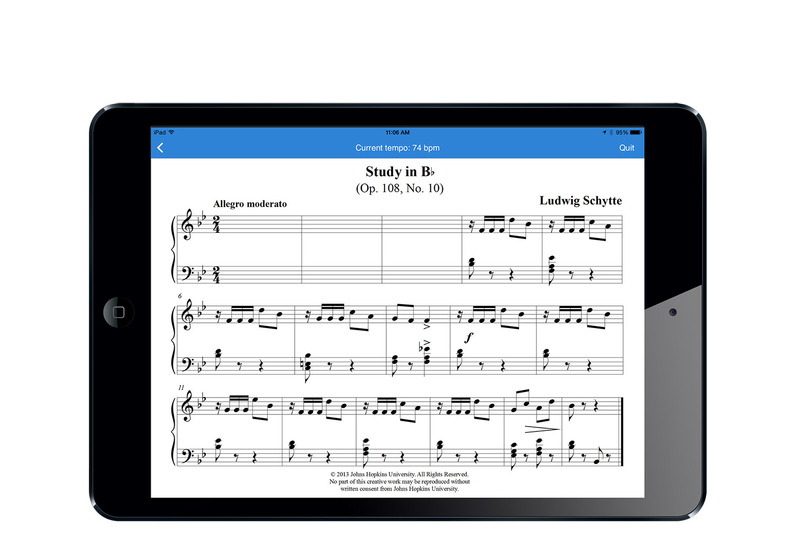 Read Ahead for iPad features innovative sets of exercises that train students to form new music-reading habits. Exercises are also contextually designed to facilitate the reading of the specific pieces of music contained in each level. The entire curriculum is based on extensive research in the cognition of reading music and years of experience teaching sight-reading classes at the Johns Hopkins University Peabody Conservatory. 1. Warm-Up: Memory, Touch, and Vision exercises focus on developing component skills involved in sight-reading and prepare you for the sight-reading exercises which follow. 2. Sight-Reading: Read Ahead exercises begin with a short preview period encouraging students to find the challenging parts before hand. This is followed by a practice session where students are compelled to read ahead of where they are playing because the music disappears in advance. 3. Fixed Scores: A final “fixed score” is provided giving you a chance to cement the skills just practiced without any computer aided guidance.